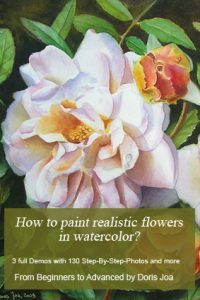 When painting with watercolors most artists struggle with finding the right method for applying their colours to the paper. This method is that what we call Watercolor Technique. What does this mean? Which watercolor painting technique works best for which area? How do we get smooth washes? How do we get control about our washes? How to have the colours flow on the paper? The wet-on-wet method allows you to get smooth washes and also to have the colours flow on the paper. Wet at first your paper and then you apply your colours into this wet area. The colours always follow the water. If there are areas which aren’t covered with water then the colour will not flow there. Note: The main rule is that the pigment always follows the water. When the paper is not wet enough, the pigment doesn’t flow. You must find the right balance -the paper needs to be wet – but not too wet. Take a piece of paper and wet an area. Make it really wet and then apply some colours. Beside this area wet another area, but not so wet as the first area and then apply again some colours. Let it dry! When it is dry you will see immediately the difference. The area with more water will lighten the colours much more. But you also will note that you got hard edges. The wet-on-dry method allows you to get more control about your washes. Your paper is dry. You load your brush with your colours and then apply them on the dry paper. This also creates hard edges and you need to soften them immediately before the washes is completely dry. I use a moist brush and then soften my edges. You also can use this method for mixing colours on your paper. Just apply your colours maybe side by side and let them flower into each other. As long as the wash is wet the colours will flow. Your brush is mostly dry (of course we always need a bit of water to get some paint on our brush), but it is only a bit of water to just pick some of our colour. Then we add the wanted detail to our painting. To paint with watercolors needs a lot of practice. And the more you paint your will become confident how to apply your colours to your paper. 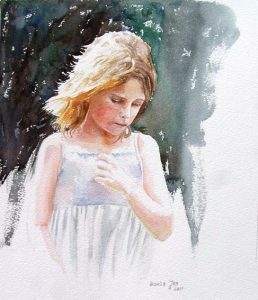 Note: Your watercolor technique – with which you feel confident – will come naturally to you and then you will paint without thinking about it. 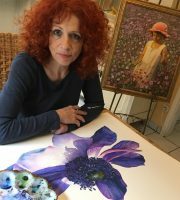 I only work with the common watercolor painting techniques in my watercolor paintings. 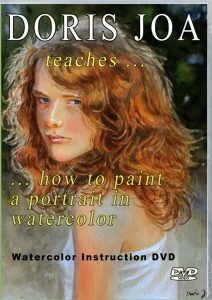 Each watercolorist will use one of these techniques. But there is a difference in style. I love to paint in a realistic and still want to have painterly touches. 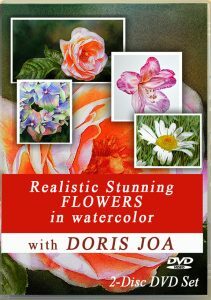 Others love to create photorealistic artwork and others like to create loose watercolors. 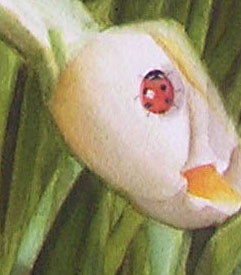 (The painting left shows you that I used the dry-on-dry technique for adding the details to the ladybug). 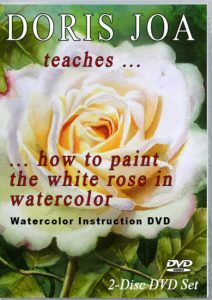 When I was filming my rose painting for my first Watercolor Video I realized that I often simply applied my colours on the dry paper and immediately used a damp brush to soften the edges of this washes. Sometimes I wet my area first with clear water before I added the colours. I just do this without thinking about it. I don’t think that we need special watercolor painting techniques to create our watercolors. It is just the knowledge which we need to have like how to build the form, how to handle our edges, how to describe our subjects in the best way, how to create neutral colours, how to create darks etc. etc. I too work with a lot of different surfaces, if it is 140 Lb coldpressed paper, 140 Lb hotpressed paper, 300 Lb coldpressed paper, Aquabord, Crescent Watercolor Board, lighter paper, heavier paper etc. And each surface will be handled differently. As excample: it is hard to work in layers when working on Aquabord. But I always like the challenge to master the surface. And I still cannot say which surface I prefer the most. But having the right knowledge what I need to know about painting helps to master the different surfaces and still to get the wanted result. It is a never ending journey. Watercolor painting techniques will come naturally without thinking about it the more we paint. 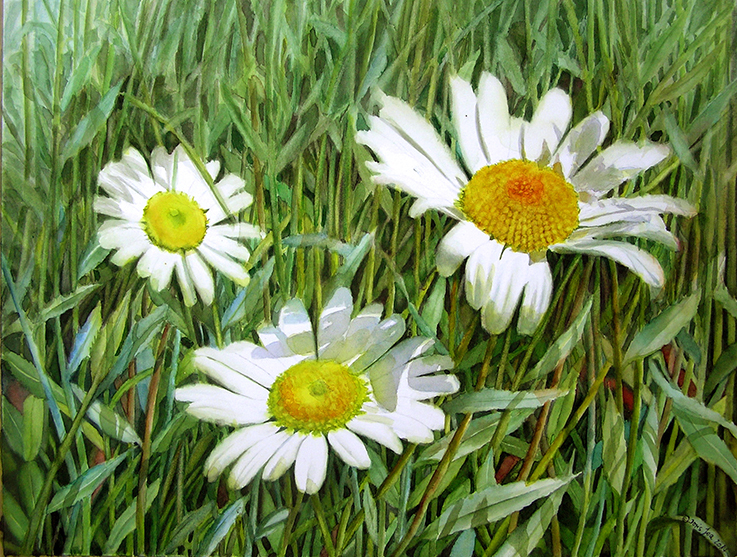 I think the most important point is that we love to paint and that we enjoy the whole process. I like to keep my painting process as simple as possible. As excample: My painting ‘Innocence’ (see left) was painted in two hours and there was nothing to do more at it. No additional brushstroke would have added something more to the message. 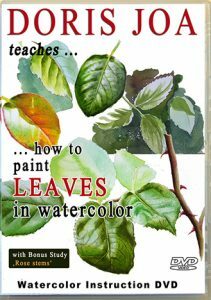 I love to share everything I know about watercolor and so I created several free watercolor tutorials here on my website. We are always learning from others, if it is from the old masters or from living artists. But one thing is important, that we need to paint WHAT WE want to paint and HOW WE WANT to do it and that we all need to find our own style.